I bought this sub when they first came out. Been so long that I don't even remember what I paid for it. Always enjoyed it. First with a pair of Boston bookshelf speaks. Then with a Def Tech setup. Now with a a Revel setup. This is a very musical sub. Very tight and not sloppy like many subs are today. Not the best choice for home theater but it holds it's own. Shame M&K went away (I know they are back as MK Audio, but it isn't the same) because they made very good stuff at a nice value point. I have been toying with the idea of replacing this V125 but I can't see spending that much more for something that will not be nearly as musical just to get more boom for movies. I will get a set of powered towers before I do that. If you can find one of these at a decent price, jump on it. I paid too much, $60 off CL and when I got it home I found out one of the input jacks had a broken center plug from connecting cable in it. Short work to get that out and it has performed flawlessly for both home theater and music since. Also have 2 other subs (I have for receivers: Yamaha RX-V1, two Denon 3805's and a Denon 3801, all hooked up to PC via distribution amplifier which I use for both HT and music. I still want one of those Dayton 15" Ultimax speaker/cabinet combo's to complete my system. Well for now, the M&K is the king of my subs, has worked flawlessly and when everything is on I am in sonic nirvana. I have more vintage speakers than you could imagine (most are of the acoustic suspension category, A/D/S M-12 towers, 2 pairs Advent Heritage towers, more Advents,, also DCM Time Frames, Prodigy, AR 18, and others I can't remember, etc) but my wife puts up with it. You can't go wrong with these M&K subs, they are really good at accurate sound. Overall I am very satisfied with this subwoofer, especially for music. It is not the booming beast that my Klipsch RW-12 is, but that thing is rated at something like 700+ watts. That being said, this thing sounds absolutely with my two infinity reference floor speakers for listening to music. Its tight, precise, and produces bass similar to what I have heard from the woofers in Definitive Technology products. 125 watts isn't a ton and for movies with explosions and things its not great but I have never had a problem with music at regular listening levels. If you are concerned about sound quality this sub is for you, if you are just trying to piss off your neighbors I would recommend going with something in a ported or slotted box with a heftier amplifier. Well, first for that kind of money, you won't get a better sub for music and movie, It's a seal type sub wich doesn't boom at all. The first good quality about M&K sub, they have an excellent electronic crossover, wich can cut mid bass cause under 125HZ, it's a 36db slope per octave. So what you will feel is pure bass. I've try numerous sub and they always sound boomy, the crossover is weak, they always have a 12db or 18db slope by octave, wich mean you gonna ear some voice in the subwoofer. The only one that compete is the DIGITAL 12 from Velodyne, wich has a computer inside where you can adjust the crossover to your taste, but it cost 4 times the V-125. But now I've found a used MX-350MKII, WOW WOW and WOW...What a huge difference between the two sub, so I place the MX-350 in front and I'm using the V-125 for a back sub. It's a room full of feeling bass. I purchased 1 V-125 about 2 years ago with the intention of buying a second later. This subs strengths are music and theater, which can not be said for many subs of higher price. Most will do great until it comes to music. This is where the V-125 is different. Tight, clean, and nothing you do not recognize, such as boomy bass that is not relavent to the track at hand. I LOVE these things. I paid 699 US for my first one and thought I would by a second when I could afford it. I lucked out and found a second one used for 230 US ! I have auditioned too many to list. But, for the money, for music and theater, this is the one. Cost. Sound. Quality of construction. I use the V125 with a pair of Maggie MMGs. The combination is a very cost effective and extremely musical pair. I believe this sub to be a sleeper and underrated. Give one a listen, you won''t be disappointed. No comparison with the other subs listed above...the V125 sub is cleaner and deeper. Definitely not a one-note-wonder like many subs out there. This sub not only performs well with HT, but is also very musical as well. Great low bass...very usable down to 20 Hz. Nice set of controls allows you to adjust this sub to work well with most satellites. Yes, I also run M&K sats as well, S85s, which match quite nicely with the V125. Even in the large room (20' X 13' with 15' vaulted ceiling) which I use this system, it performs extremely well, although I wish I could have afforded one of M&K higher end subs. The price was a little high ($699 locally) but when compared with others in this same range, it is still a great value and will outperform the competition even though its power rating is typically listed lower than the rest. Don't let that fool you...this is a serious sub! 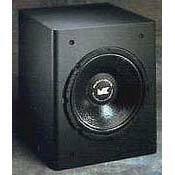 Two words describe this subwoofer: BIG BASS!!! This is an marvelous subwoofer providing rich, clean, deep bass. I have my sub turned down (don't want to annoy the neighbors) yet it still provides plenty of oomph when needed. I am really pleased with this sub and would definitely recommend it to any enthusiast. I just bought the unit last week and so far, I could say that I'm quite satisfied. I understand it will take some time to break in the subwoofer but it has been showing a lot of good qualities already such as smooth, tight and very musical bass. It blends seamlessly well with my sonus faber concerto speakers. To round out my system I purchased this sub. Everyhing seem's clearer with it connected. The sub will not make you sit up and go " WOW " or draw attention to itself, but when taken out of the system, you will wonder what is missing. It does it's job wonderfully of adding depth to the bass and a clarity to the overall sound. If you want the " WOW " factor then look else were for something that exagerate's the bass and in the end is not true to the original recording or soundtrack.